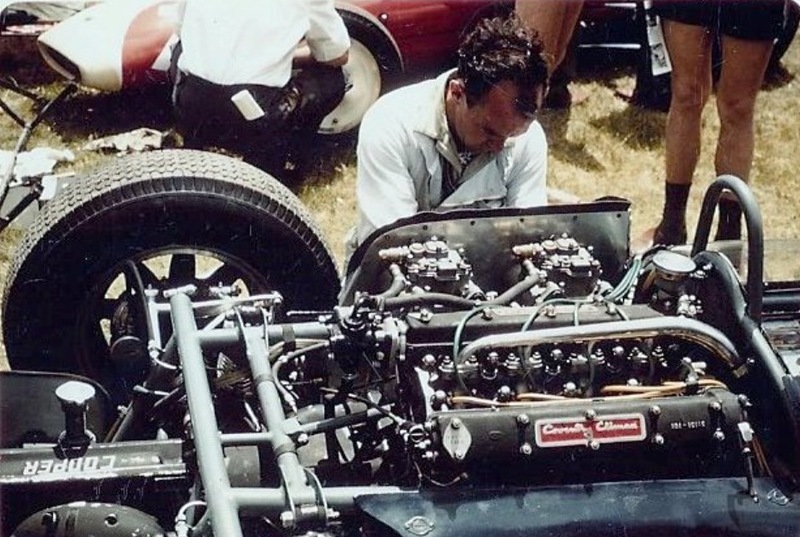 In the late Formula Libre period in Australasia, just before the Tasman Formula commenced on 1 January 1964 the engine of choice was very much the Coventry Climax FPF. In fact the Tasman Formula was specifically designed around the ready availability and price of the 1959/60 World Championship winning 2.5 litre FPF engine to allow the locals to compete against the internationals on more or less equal terms. Before then (1 January 1964) ‘the go’ was the 2.7 litre ‘Indy’ FPF, most of the locals and visiting internationals each summer raced with this engine. But down in Australia’s south, in beautiful Tasmania, a very clever engineer, Geoff Smedley was working on another solution to make the FPF produce more reliable power and torque. His driver was the very quick John Youl, the car an ex-works/Bruce McLaren 1961 F1 Cooper T55. Here is the story in Geoff’s words. 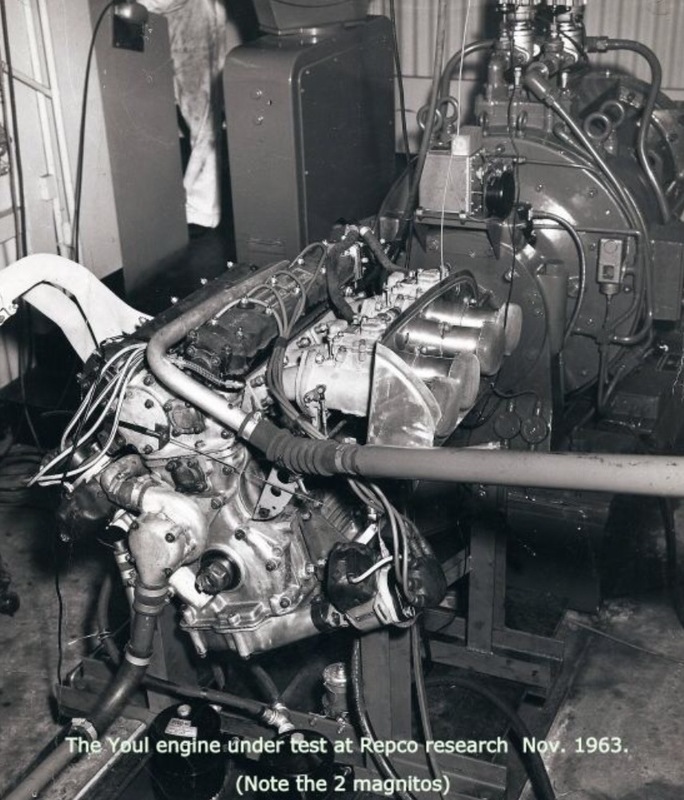 ‘Firstly in 1963 the fad was to re-sleeve the 2.5 Climax to 2.7 litre chasing more hosepower but ‘bigger holes’ was the American way and I was sure a better alternative could be found. Frank Hallam at Repco Research had been playing around with a twin plug head for one of Brabham’s engines, using two distributors driven from the rear of each cam bank and couldn’t make it work through an inaccurate spark which was put down to windup in the camshafts in the high rev range. ‘The initial effort seemed rewarding with a test day at Symmons Plains circuit, the result was pleasing and being able to alter each magneto individually the differences were very noticeable. Living in Tasmania and being able to carry out this work undercover of our opposition (who were based on the Australian mainland) was an advantage, I and my young family were living at Symmons Plains in those days and my workshop was a converted coachouse close to the main homestead where all the chassis work was carried out, but the big advantage I had was having full use of the family workshop (Bedford Machine Tools) where I was able to produce any part required. ‘Gosh! It’s hard to believe more than 54 years have passed since those heady days but it doesn’t seem that long, but as mentioned I have been pressured into writing my autobiography which has meant scratching back over the coals to bring those great times back to life again and starting with taking the land speed record way back in 1961’. We will trouble Geoff for that story, achieved by Geoff’s Chev engined Cooper T51 owned and driven by Austin Miller, another time. ‘I went to work for John Youl in 1962 and stayed with him until his retirement in ’65, we had a lot of fun as a team being able to work here in Tassie so privately and then going to the mainland where the car would be pounced on and inspected for the sign of any tinkering’s that may help our opposition! So in that respect it was always a lot of fun and yes the duel ignition trick really did work wonders on the old FPF engine’. ‘Now the very first race for this new configuration was the Gold Star Race at Mallala, South Australia on the 14th October 1963 which we won from Bib Stillwell and Wally Mitchell. Then came the Hordern Trophy Race at the ‘Farm on 1st December 1963, we won that one as well from David McKay and Bill Patterson’. ‘Then it was off to New Zealand for the 1964 Tasman Series. 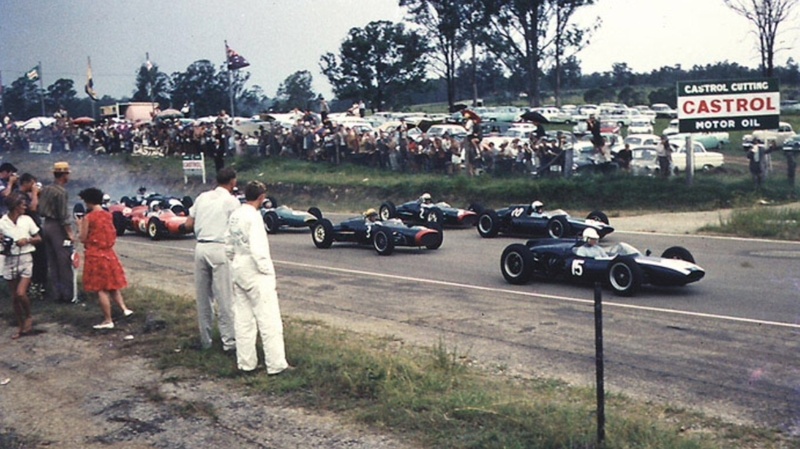 In that series of races we came back with (in heats and championship races) one 1st, two seconds including Lakeside, two thirds including Sandown and fourth’s at Levin, Wigram and in the New Zealand Grand Prix at Pukekohe behind Bruce McLaren, Denny Hulme and Tim Mayer. We were fifth at Longford in the final round’. ‘Prior to all this, we, like others using the Jack Knight gearbox on their Coopers, found the crown wheel and pinion was the big weakness and only 2-3 races seemed to be their life span. So i set about making 2 sets myself as I fortunately had access to the family business’s machine shop. The first set of these was fitted to the gearbox just prior to fitting the duel ignition system’. ‘This new CWP was straight cut but considerably stronger using a much higher grade steel than the original. Although a little noisy at first, it soon settled down by fitting a separate oiling system. The same CWP was in the car when John sold it to Arnold Glass in 1965. ‘The car, then around 1967, I think- Cooper T55 Chassis No. F1/11/61 was sold to a collector in the USA and years later in the nineties the car was sent to England to be auctioned. I have found it there in photos sitting in the pits in places such as Goodwood and the like’. The shot below is of Youl jumping from second grid slot away from McLaren #10 on pole, Tony Maggs #3 and John Surtees #2, as well as Bib Stillwell in the light blue Brabham BT4 and Chris Amon’s red Cooper T53- its the start of the Lakeside International on 17 February 1963. McLaren, in a Cooper T62 the two Lola Mk4A pilots Maggs and Surtees and Bib were all driving the latest cars with 2.7 FPF’s, Youl was in a 1961 car, his Cooper T55 with a 2.5 FPF, not Smedley’s twin-plug engine either. Surtees won from Graham Hill’s Ferguson P99 and Stillwell. Youl retired on lap 7 that day. Its such a shame ‘duty called’ with John Youl, he needed to manage the families large grazing properties in Tasmania, so his racing career was ended way before it should have. For sure he was a driver of world class, as indeed was Smedley as an engineer/mechanic. Another brilliant informative story and what an amazing era in Australian Motor Racing. Amazing bit of innovation isn’t it! Geoff’s book will be a ripper too- bits about the Youls, Matich, Austin Miller, he had a stint in Asia, and the rest! Will drop him a note to find out. Derek Kneller is busy on one in the UK at present too- it will be a beauty generally and specifically about his 1969-74 years with Frank Matich- not sure how far it is away either! Thanks Mark, another great article. The very first Warwick Farm meeting I went to, was the 1963 Horden Trophy. I seem to recall that Bib Stillwell and Frank Matich tripped over each other, and that it was David McKay’s last race in the Brabham BT4. My memory is getting a bit dodgy, but wasn’t Geoff Smedley with the Howard brothers, post Matich (designed their downdraft head)?…. or have I got that completely wrong. A good excuse to buy the book. Thanks for reminding about the Matich/Stillwell collision, I have an article ready to go on the early Intercontinental Brabhams, I must put it up at some time. Geoff went from Youl to Matich and then I think the Howard’s after that but I have no knowledge of their cars so am not sure what was achieved. Am just researching an article about McKay’s Lola Mk1 Climax at present and was only flicking thru his wonderful biography last nite- I’d forgotten how good it is about not just him but the scene at the time. 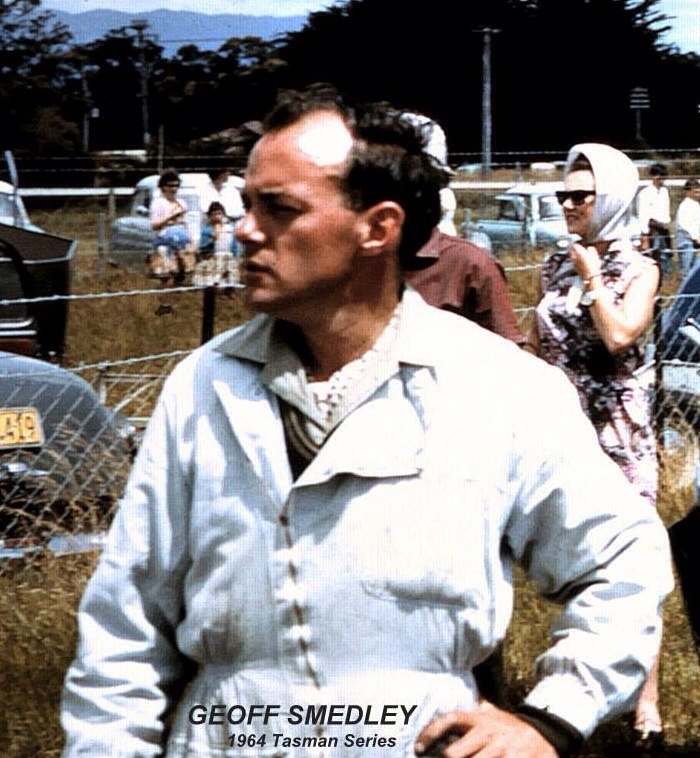 He was stiff not to win the ’61 AGP at Mallala and unfortunate for we fans he got into single-seaters too late- with the Aston’s he had the budget to buy one but for his own reasons went with the sporties at the time rather than, say, a 250F. Adding McKay into the single-seater mix circa ’56 would have added depth to our Gold star fields. Such a great story, John Youl was as good as they get. A couple of corrections, John retired after Lakeside in 1964 selling the Cooper to Arnold Glass who finished 5th in the Hordern Trophy that year and of course it was John who had the monumental accident at Sandown in 1962 when he was clipped by Bruce McLaren coming onto the main straight. I am convinced that John Youl if he had kept racing could have been one of our great champions, in many ways he was. Many thanks for the memories. Thanks for the corrections. I will get to John Youl as a feature at some point but probably best to wait for Geoff’s book and do a précis then. Key Gavin Youl into the primotipo search engine if you have not seen the article about him I wrote 6 months or so ago.